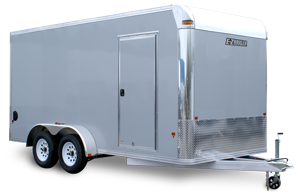 EZ-Hauler all aluminum enclosed trailers are the perfect solution for customers looking for a durable, light weight enclosed trailer. EZ Hauler has trailers for motorcylces, ATVS, UTVS, cars, snowmobiles and contractors. 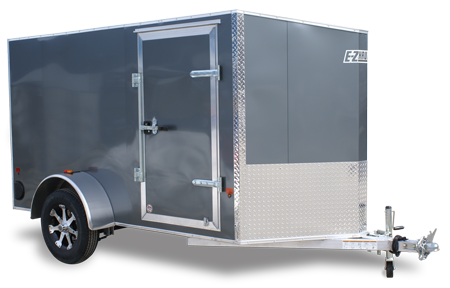 EZ Hauler offers hundreds of options to customize any trailer. 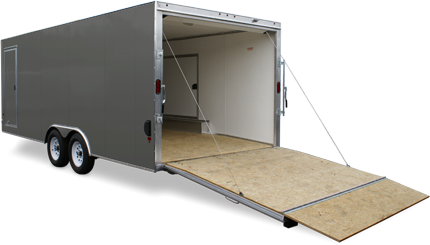 5'-Wide, 6'-Wide and 7'-Wide E-Z Hauler Aluminum Trailers are available in multiple lengths and loaded with tons of features and an expanded choice of options.​ Single Axle and your choice of rear ramp door or barn door. 6' wide and 7'-wide these E-Z Hauler Aluminum Trailers come in multiple lengths with tandem axles. Whether you're hauling motorcylces, a UTV, furniture or using it as a rolling work shop these trailers help get the job done. This series offers standard front and rear ramps and an inline design that is great for towing, loading and unloading snowmobiles. LED lights, radials and screwless sides come standard on these models with a vast selection of options available. The E-Z Hauler Aluminum Trailers Advantage Series Car Haulers are packed with hard-to-find features at a fantastic price point.With standard aluminum decking and ramp, and a low profile design, this aluminum trailer is perfect for hauling cars.LED lights, radial tires, cast aluminum corners and screwless sides come standard and tons of options are available.​ Available in 20' and 24' lengths. 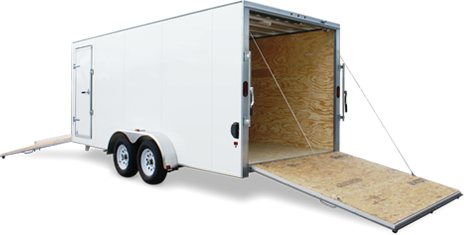 EZ-Hauler's 8' wide trailer is available in lengths starting with 12'. These can be customized with hundreds of different options for hauling bikes, a car, landscape equipment or work related items. See the list below for most standard features.